Item number 07.467.8229 from the Brooklyn Museum. 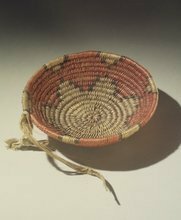 Basket woven in coil method by Jemez weaver Filipe Yepa. Although often attributed in style to Navajo or Apache Yepa was one of five or six men making baskets in this style. The red dye was obtained from the Armenian trader in the town. In some houses baskets not in use were suspended from the rafters, bottom side up, in neat rows. Today men in the Jemez Gachupin family still make coiled baskets, Alcario Gachupin purportedly learning from Yepa. Women used such baskets in a ceremonial dance where they held the basket, "life basket", holding all they will consume. The design is the steps of the cycle of life representing both worlds, black and red,-the here on earth and the spirit world.